Critical Heritage Studies is a new and fast-growing interdisciplinary field of study seeking to explore power relations involved in the production and meaning-making of cultural heritage. 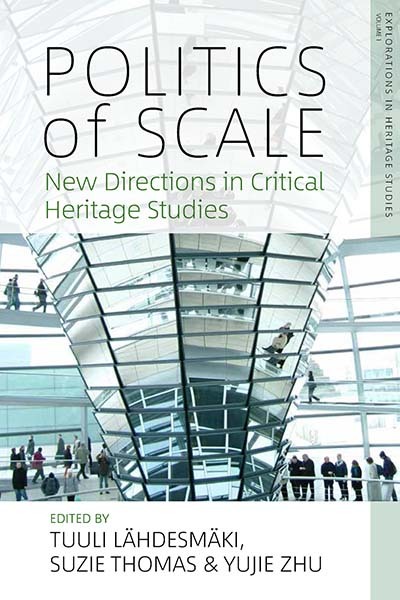 Politics of Scale offers a global, multi- and interdisciplinary point of view to the scaled nature of heritage, and provides a theoretical discussion on scale as a social construct and a method in Critical Heritage Studies. The international contributors provide examples and debates from a range of diverse countries, discuss how heritage and scale interact in current processes of heritage meaning-making, and explore heritage-scale relationship as a domain of politics. Tuuli Lähdesmäki is an Academy Research Fellow and Adjunct Professor at the Department of Music, Art and Culture Studies, University of Jyväskylä (JYU), Finland. Lähdesmäki specializes in heritage, culture, and identity politics particularly in the European context. Suzie Thomas is Professor of Cultural Heritage Studies at the University of Helsinki, Finland. She is interested in non-professional and so-called alternative engagements with cultural heritage, ‘dark’ heritage and heritage crime. Yujie Zhu is a Lecturer in the Centre for Heritage and Museum Studies at the Australian National University. His research focuses on heritage, tourism, memory, religious practices and cultural politics.